RS Components (RS), the trading brand of Electrocomponents plc (LSE: ECM), a global multi-channel distributor, has announced a major extension of its PCB Part Library, which provides a key tool for engineers working in PCB design by delivering direct access to schematic symbols and footprints. The library now includes more than 10,000 new models from a range of leading suppliers, including C&K Switches, ON Semiconductor and ROHM Semiconductor. RS first launched PCB Part Library in 2017 in conjunction with SamacSys, the world’s leading supplier of high-quality PCB schematic symbols and footprints. The library provides fast and easy access to component models and saves PCB designers and electronics engineers from the time-consuming and potentially error-prone task of having to create part libraries manually. “PCB Part Library helps engineers by removing the need to source and create models and footprints from scratch, enabling them to focus on their overall design,” said Mike Bray, Vice President of DesignSpark. “RS recognised this need and we have worked closely with SamacSys to create the PCB Part Library solution. Our pioneering partnership has helped revolutionise the way that engineers access models for their designs. "With component manufacturers such as ON Semiconductor working with us, it demonstrates their commitment to providing valuable design assets such as symbols and PCB footprints,” added Alex MacDougall, Managing Director at SamacSys. "It's fantastic to have the key players in the electronics industry collaborating with us. Our partnership with RS is key in allowing us to continue our mission of helping more engineers design their products in less time." 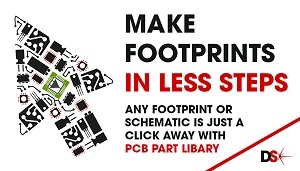 The schematic symbols and footprints in the PCB Part Library can be used in all leading PCB design software packages, including the free-for-download DesignSpark PCB tool.